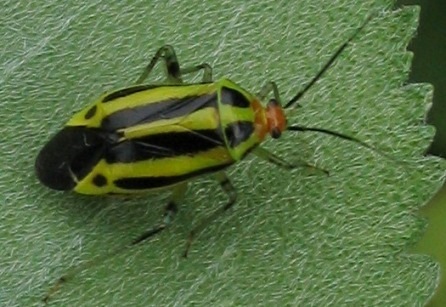 Fourlined plant bugs, Poecilocapsus lineatus, are common pests of many herbaceous perennials including chrysanthemum, mint, Chinese lantern, liatris, basil, and shasta daisy as well as fruits, especially currant and gooseberry. 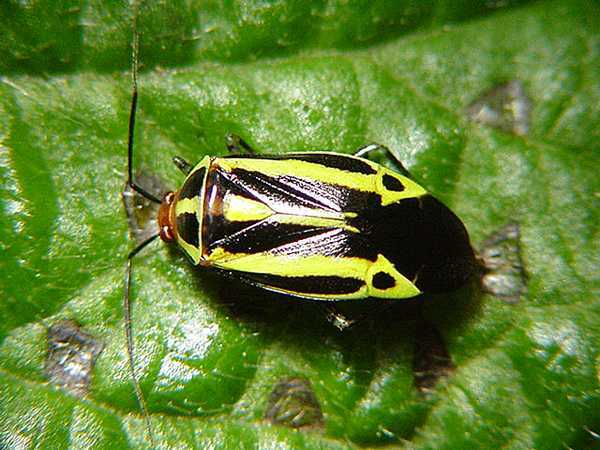 They may also feed on woody ornamentals such as azalea, dogwood, forsythia, viburnum, amur maple and sumac, and they feed occasionally on flowering annuals, including marigolds. Adult fourlined plant bugs overwinter as eggs laid in clusters into a slit near the top of canes of currants, brambles and other woody plants.